Spring brings with it so many familiar feelings. Restoration, excitement, and the promise of warmer weather and longer days. It’s important that you translate these feelings to your home, so that you are living in a space that is uplifting and inspiring. Just as we have cosy blankets, throws and warmth radiating from our home in winter – spring deserves the same honour. Here are 6 ways to improve your home’s look this Spring. There’s little else that can change the look of your home so dramatically like blinds can. The windows are always the centre of the space, and with fresh blinds framing them, you can achieve a new stylish look that will make the whole room feel lighter. The type of blinds you choose will vary on your home, but plantation shutters and timber venetians have both a neutral and designer feel. Perfect for elevating the style of your home this Spring. You wouldn’t think that these plump little things would make much of a difference, but they absolutely do. Seasonal cushions allow you to seamlessly add a new colour thread of pattern into your home, which can flip the weight of your space instantly. Yellow, light grey, light blues and pink are great for Spring. And what kind of Spring would it be if we didn’t mention the power of floral patterns? Build a collection of cushions that you can alternate through the seasons. Replacing carpet is to big of a job, as it revealing or covering hardwood floors. To give your space a hit of style this Spring, scout some rugs and mats that will be a nice reprieve from your heavy carpet or warm floorboards. You can find rugs and mats made from cotton, polyester, bamboo, and recycled plastic. They look great when layered in a living space or poking out from under a bed. How long has that print or painting been on the wall? Probably so long that you’re starting to think they came with your home. Hit refresh on your cultural concept and set about scouting some new work. Remember, it can also be sculptures, macrame, statues, and any art form. Whatever speaks to you on a real level and works in with the style of your home. This tip will take a little more effort. 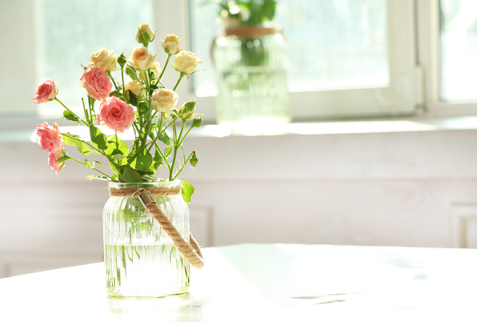 Be committed in adding and replacing fresh florals around your home in Spring. You will be surprised to see how much they add value to your day, and will be the first thing noticed by visitors and guests. You can rationalise the effort and cost by telling yourself that Spring is only a few months long, and it fills your home with a sweet aroma and clean oxygen. The florals will play off the colours in your home and create a beautiful presence. Perhaps this is too much of an effort for one season, so why not just paint some of your walls? Give your skirting boards and trimmings a fresh lick of paint – something light. This will radically change the look of your home and it will even make the walls you didn’t paint look like they have a new lease on life. Keep it very neutral, you want this scheme to be able to work all year round in case you don’t change it again. Spring gives us an opportunity to reinvent our home. Leaning in to the festive colours and florals will make it all the more fun, and will make your home a living and breathing embodiment of the seasons. To keep things balanced, always weigh up each decision by asking whether this would be tired or kitch in six months time.